Houston, TX (June, 2012) – The Associated Masonry Contractors of Houston presented Camarata Masonry Systems, Ltd. with the Golden Trowel Excellence Award in Government / Institutional category for Hays County Municipal Government Complex. This project, along with Camarata Masonry Systems, Ltd., also received the Texas Masonry Council 2012 Honorable Mention (Government / Institutional) Golden Trowel Award in August 2012. 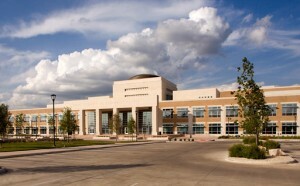 The new 232,000 square foot Hays County Government Center in San Marcos, Texas was designed to incorporate ten courtrooms and space for county departments that are currently scattered throughout the area. The energy efficient three-story building is designed to provide state-of-the-art, secure courtrooms as well as adequate workspace as the county grows in population and services. There are many details on the project that could go unnoticed to the untrained eye but were extraordinarily difficult to build. The first floor stone columns are only one piece wide and fit in between the windows with 3/8” caulk joint on each side. As their location on the elevation is fixed, careful coordination with the adjacent trades was required and accuracy of installation was paramount. Similarly, the base stones under the windows were one piece and fit between the brick ledge and the window with a single 3/8” caulk joint. Another challenge was created by the sheer size of the building. Efficient distribution of materials, scaffolding and manpower was an ongoing initiative. Long site lines with prominent architectural features mandated almost perfect alignment since any deviation from line or plane could be easily detected. The end result is a well executed, highly efficient state-of-the-art facility which will serve Hays County for decades to come. 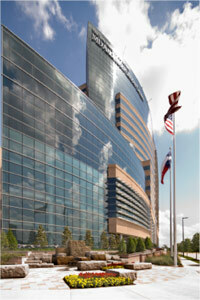 The University of Texas MD Anderson Cancer Center Mid Campus Building One is comprised of a 25 story tower, an 18 story tower and a 3 story meeting center. The new facility will provide office space for departments currently located on the Main Campus and various lease sites in and around the Texas Medical Center and totals approximately 1,414,000sf. The hardscape project consists of two fountains (Bertner and Braeswood) made from massive split-faced Texas Pearl granite blocks, slabs, steps, wall panels and copings ranging in weight from 1,275lbs to 25,500lbs. The relatively random and straightforward look of the fountains belies their complexity. Camarata Masonry Systems, Ltd. engineered and installed the stones utilizing a 160 ton hydraulic crane and specially designed lifting devices. Since the fountain stones are “keyed” into one another, they have split faced exposed surfaces but sawn faced abutting surfaces with extremely tight joints. This “keying” condition also created a specific order of installation (since one piece is dependent on the next) and necessitated that the massive blocks be “dropped in” from above. However, since the top surfaces were to remain exposed, any indication of anchoring devices needed to be completely removed from view. Camarata employed extremely large self tapping wedge bolts which passed through specially designed lifting plates and into holes drilled into the stones. Once the stones were installed, the bolts were backed out leaving a threaded hole. These holes were core drilled and split faced stone plugs were fitted into them and affixed with matching color epoxy. The end result is seamless with no evidence of any tampering. Camarata Masonry Systems, Ltd. achieved its ultimate goal of skillfully installing these unique fountains, juxtaposed with an existing modern façade, efficiently and safely with no injuries or accidents.